On April 5, 2018 the City Colleges of Chicago Board of Trustees unanimously approved Board Resolution 33420, which changes the tuition rate from a tier-based rate structure to a hybrid tuition rate structure. Beginning with the summer 2018 semester, part-time students enrolled in fewer than 12 credit hours will be charged on a per-credit hour based rate structure and full-time students enrolled in 12 credit hours or more of coursework will continue to pay a flat rate. The new tuition structure charges part-time students the same rate per credit hour as a full-time student enrolled in 12 credit hours. This decision partially reverses a change made in 2015 as part of the FY2016 budget when City Colleges changed the District’s tuition and fee structure from a per credit hour based tuition and fee structure to a tier-based tuition and fee structure that combined the tuition and fees into one flat rate for students depending on their enrollment status, effective for the fall 2015 semester. In the FY2016 budget book, the District argued the transition to a flat-rate tuition structure would encourage timelier completion of degree programs, compensate for declining tuition and fee revenue and provide students with certainty of future costs of enrollment. Under the tier-based structure, full-time students taking 12 credit hours or more paid $1,753.0 per semester, part-time students taking two classes or more, up to a total of 11 credit hours paid a flat rate of $1,069.0 per semester and students taking only one class paid a flat rate of $599.0 per semester. Based on an in-district to in-district comparison of community colleges in northeastern Illinois, the transition moved City Colleges from being one of the lowest cost community colleges in the northeastern Illinois to one of the highest, depending upon the program and number of credit hours taken. However, City Colleges remained a low-cost or the lowest cost community college in the region for full-time students enrolled in 14 or more credit hours. The Civic Federation noted that there was some risk associated with this transition for the District, as it could precipitate a further decline in enrollment and a corresponding decline in tuition and fee revenue below projections. Although the District informed students by providing information on the District’s website, through email communication and by other means, the Federation believes the proposed change in tuition structure should have been communicated to the students before opening registration for the fall 2015 semester. 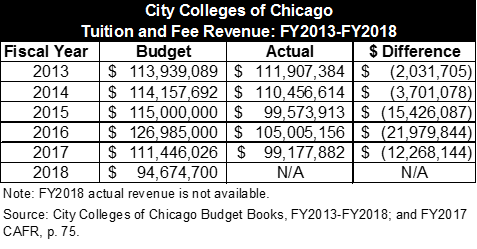 The table below displays the difference between budgeted and actual tuition and fee revenue for City Colleges between FY2013 and FY2018. City Colleges has seen a continued decline in tuition and fee revenue in recent years due to enrollment loss. In FY2016, the first fiscal year of the tier-based tuition structure, City Colleges budgeted for a total of nearly $127.0 million in tuition and fee revenue, but fell nearly $22.0 million short of the budgeted amount. The decline in tuition and fee revenue was partially due to the State budget impasse, which affected state MAP grant funding for low income students and therefore enrollment. Between FY2013 and FY2017, City Colleges saw a decline in student enrollment of 24.5% or 11,303 students. In FY2017 City Colleges budgeted for a 3% decline in enrollment, but saw an actual decline in enrollment of 10%. In FY2018 City Colleges projects a 5.0% decline in enrollment from FY2017. 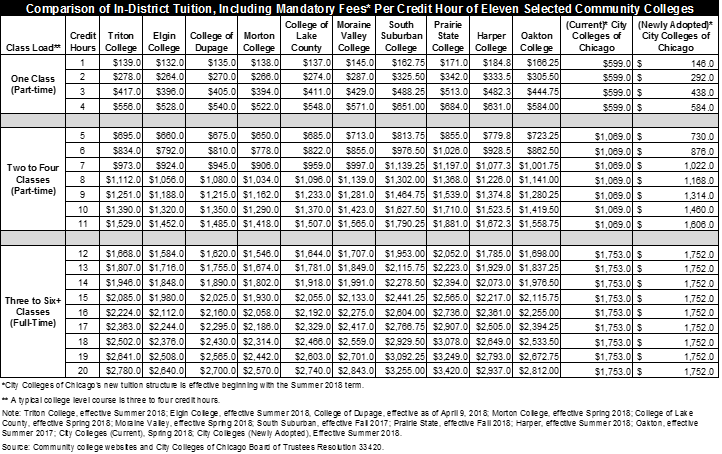 The following table provides the historical tuition rates in place from 2007 to present. Prior to FY2016, City Colleges had not raised in-district tuition rates for four years despite rising costs and reduced funding from other revenue sources and had also minimized its impact on taxpayers by holding property taxes relatively flat. The Federation believes user fees are preferable to general tax increases, but has previously raised concerns that if tuition rates continued to stay flat, students may see a steep increase in tuition rates in the coming years as spending pressures mount, particularly from staffing expenses. 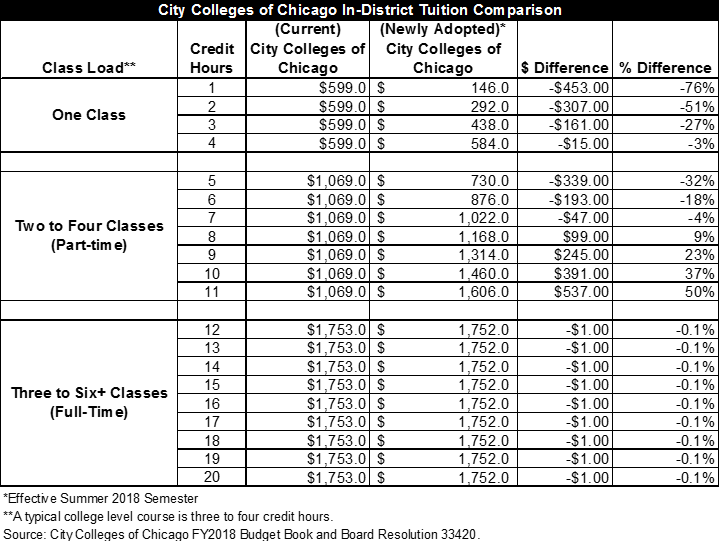 The next chart provides a comparison between the tuition rates currently in place at City Colleges of Chicago and the newly adopted tuition rates that will take effect for the summer 2018 semester. As previously noted, City Colleges is transitioning back to a per credit hour basis for part-time students while keeping a flat rate for full-time students taking 12 credit hours or more. The final chart provides an in-district to in-district comparison of community colleges in northeastern Illinois. Under City Colleges’ current tuition structure it is one of the highest cost community colleges in northeastern Illinois for part-time students. However, with the newly adopted hybrid tuition structure it will drop from being one of the highest cost community colleges in northeastern Illinois for part-time students to being in the middle of the pack when compared to the other community colleges in northeastern Illinois. City Colleges of Chicago will remain a low-cost or the lowest cost community college in the region for full-time students enrolled in 12 credit hours or more. The Civic Federation looks forward to the release of the City Colleges of Chicago FY2019 budget this summer. 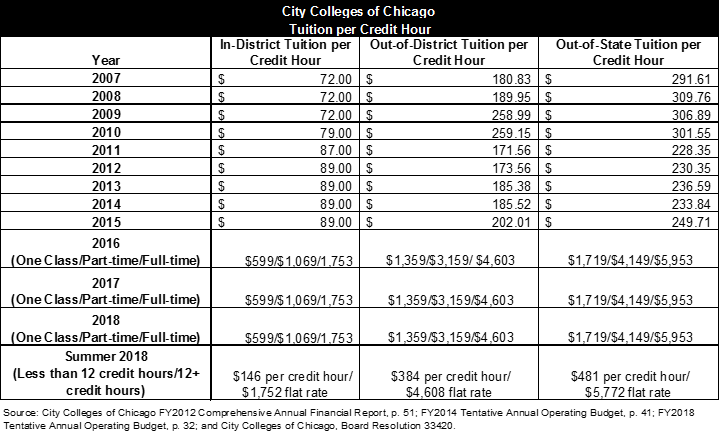 City Colleges of Chicago, Budget Book, p. 7.